I got my visa on 27th Nov '13. Initially during the process it was a moment of frustration, followed by hope, anxiety and later success. I would like to extend my gratitude to you and your team especially Alex and Tabassum who have been in constant touch and worked in an orderly manner. You have been great through out the process. Continue to do so by extending support for many out there who are chasing their dreams in getting their VISA. I strongly recommend (in fact recommended many already) for any Visa aspiring Applicants to process through Abhinav as you have proved "what you say you are"
Firstly, Thanks a Ton to ‘Abhinav team – Rohit, Geetha & Kirti Dutta’ for their excellent support, professionalism, sound knowledge of immigration procedures & top class service which ensured a seamless process(given the complexity involved with the process & documentation), wich resulted in we getting our Australian PR today – December 13th,2013. As well, another key point noticed was their transparency with respect to process & procedure. We would like to highlight the excellent service from Kirti Dutta, in terms of rapid communication, support with documentation and other clarifications. Still remember the day we opted for Abhinav outsourcings for our Down under plans- it was purely based on the testimonial page(Abhinav Website) which propelled us to go ahead with them and right from the beginning, we became aware of their caliber in terms of service. This resulted in referring their service to couple of our friends who were planning for their overseas plans and for sure, we would highly recommend Abhinav’s team to anyone for their overseas plans, anytime. Best wishes for providing great service to many more people. I am pleased to inform you that i have recieved my Ausralian PR Visa on 22 October,2013. I would like to thank Abhinav for supporting me in processing PR application till the end. You were always supportive in providing information and suggesting alternatives whenever there are changes in immigration laws. Thank you once again for your support. I would definitely recommend Abhinv for my friends who wants to migrate. This is Namrata and Rohit Chadha. We filed for Canadian PR through Abhinav Consultants, and got stamped passports and landing papers yesterday. At this point of time, we would like to express our gratitude and thank Abhinav Consultants for their full support throughout our journey. We were guided by Usha Ji and subsequently filed our application through Rakesh Ji/ Shalini Ji at New Delhi Office in December 2009 and it has been an exciting ride. A special mention for Rakesh Ji who has stood for us through our thick and thin in this 4 years journey demonstrating highest level of professionalism, patience and support. We constantly bugged him but he kept the ship sailing and helped us reach the shore. He suggested appropriate actions to be taken at appropriate times, which finally led us to this stage. Having said this, we also know that there are plenty others from Team Abhinav who provided there valuable contribution, we extend are gratitude to each and every one of you to make this happen, KUDOS to Team Abhinav!!! There isn't enough that we can do to thank you for helping us achieve our dream of immigrating to Canada and once we are in Canada, we would still want to maintain our relationship with you and would love to return the help and support in any which way we can. Rakesh Ji do bug us, you surely deserve the right. Undoubtedly we would recommend Abhinav Consultants to anyone looking out for Immigration Services. Thank you once again Abhinav Consultants and Rakesh Ji for converting our dreams to reality. Well it was around 1 year when after seeing an advert I mailed to Abhinav and promptly I received a call from Tabassum asking for my details, Qualifications etc. During the 10-11 month period of creating supporting documents to the relavant authorities, staff at Abhinav especially Alex were very supportive, kind and patient to push/prod me to make an effort as documentation can turn out to be a tedious process of running from one former company to another and sometimes companies we served might not be existing also. Their focus on getting work and making things happen is really good. The most important part was the transparency, professionalism with which all the financial transactions were carried out.In a world with mismatching human values and conflict, it was these acts of giving hope, retaining faith and financial discipline that makes us to continue to believe in human decency and ethics. For people whom to part with their hard earned savings to an agent separated by time or distance and invisible would be quite terrifying, the stress of waiting and holding hands. Me and my family are grateful and indebted to Abhinav on the same of working hard to getting us a PR to Australia. This is Priyanka and Vineet Pathak. We filed for Canadian PR through Abhinav, and got stamped passports and COPR few days back. 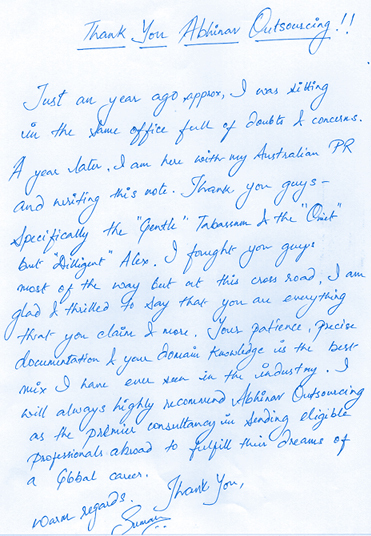 We would like to thank Abhinav for their full support throughout our journey. We had filed our application in Bangalore through Rithika, and subsequently were dealing with Rakesh at new Delhi Office. A special note for Mr. Rakesh who has stood for us through our thick and thin - it was 3.5 years journey, and we were calling him from various parts of the world in different time zones.He suggested appropriate actions to be taken at appropriate times, which finally led us to this stage. Would refer Abhinav to anyone looking out for Immigration services. I received my Australian PR finally yesterday and am so very happy. A big thank you to Team Abhinav especially Komal who was our point of contact in Mumbai and Kirti chauhan and Geeta from Delhi who were most helpful during our 6 month journey. There were times when I came hard on you guys but today when I look back I realise that your documentation and advise was water tight. Not even once did I get query from any case officer at any level i.e vet asses, state or at Diac. I think you guys are wonderful and I shall recommend you to whoever want to migrate. Thank you for your coordination and guidance for getting us the Australian PR Visa. We highly appreciate your faster replies to all our queries in each phase of the visa process and also very grateful for the professional advice you have provided especially in the final stage. Also we thank Tabassum and everyone at Abhinav for their support. I finally received my entire family’s Australian PR Grant Notification. It's like a dream coming true. The process was long and required submitting extensive documentation, but during this whole process I was supported by the great team of Abhinav. A special thank to Kirti Dutta and Komal from Mumbai office for their advice, patience and their positive attitude who helped us to understand each step in the process to get the Visa. There were situation where I as an applicant got frustrated with the demands and service but it was their calm and professional attitude which helped us so easy to conclude successfully with this complicated process. For all these reasons, I have already started recommending Abhinav to few of our friends and relatives. I am sure they will be benefited as well. Once again, a Huge Bundle of Thanks to the Team Abhinav.